All eyes are on Syria as Russia’s military campaign intensifies, and as tens of thousands of refugees continue to flee the war-torn country for Europe. What is life like for those who are left behind? In Inside Assad’s Syria, veteran FRONTLINE correspondent Martin Smith makes a dangerous and revealing journey into government-controlled areas of Syria as the war escalates. 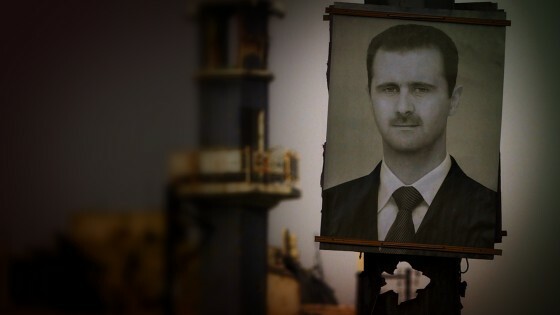 The resulting documentary delivers an up-close look at both the Assad regime’s efforts to hold onto power, and the realities of everyday life for ordinary Syrians caught in the crisis. Starting in late July, Smith spent three weeks on the ground in Syria — from the central cities of Damascus and Homs, to the far South, to the Alawite heartland further north. As ISIS, Jabhat al-Nusra, and Western-backed rebels continued to push forward, Smith sat down with regime supporters and officials who defend Assad’s actions, and insist that his leadership will save the country. The documentary is an unsettling look inside the perilous reality of everyday life in Syria, where the mundane – men playing games, bakers making bread, people dancing at a rooftop bar – exists side by side with the tragic. With Russian jets now bombing ISIS and rebel positions in Syria — including forces trained and backed by the United States — Inside Assad’s Syria is a raw and rarely-seen glimpse inside a country in crisis.